2 Lines of Free Engraving! 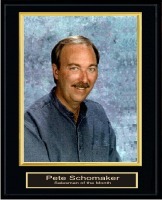 This high quality plaque displays your 8x10 picture in a gold frame with a clear acrylic front. The frame is mounted on a Solid Matte Black plaque. Photos can replaced for monthly or yearly recognition. Ordering more than 1 award? MATTE BLACK with Gold Frame for 8x10 photos.